A heartfelt thanks to our Neurofibromatosis (NF) families, doctors, volunteers, board members and donors for making the foundation a home for patient support and research for the past 25 years. You have made a difference in the most tangible, human way. If you are new to the foundation, you have picked an important time to learn more. The year 2007 holds real promise for NF patients who have been told for decades to live with a crippling and sometimes fatal disease that has no cure and no treatment. But critical research is going to clinical trial as I write this letter with signs that tumor growth can be stopped and implications that are enormous for both NF and cancer patients. To ensure this kind of research continues, several NF foundations from around the country came together in D.C. this month to lobby Congress for continued research money. We are asking for $20 million in 2007 to continue the momentum of the $182.3 million dollars that have been invested in NF research since 1996 by our government and the Department of Defense. I fully intend to look my son Drake in the eyes one day to tell him my husband Steve and I were part of a great big network of people who helped cure NF. I hope you will join us in whatever way you can to make that vision a reality for all NF patients. Join us for Dining Out in Dallas on April 12. To all of you have have been supporting me, by your visit to my site and leaving comments on my blog. I do plan to attend the nf symposium. May 5th is the day I have marked on my calender. I would love to meet all of you that have been a part of the great things that are happening on my site. 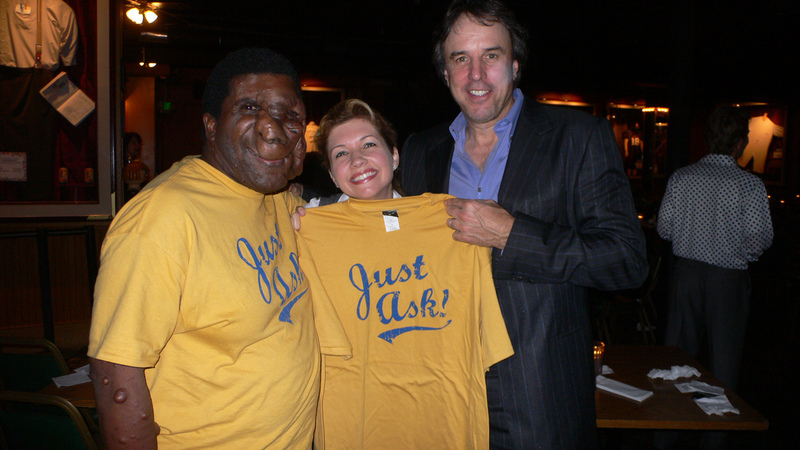 I will be proudly wearing my JUST ASK t-shirt. I hope to see you there. If you plan to attend. post it here. Looking forward for making new friends.